Baozene® contains an excessive amount of Dietary Fiber. It's soluble fiber lowers absorption of glucose and is reported to have a role in reduction of total and LDL Cholesterol. When you think Calcium, you think of Milk. Baozene® exceeds the amount of Calcium that is contained in Milk! Most Iron is contained in red pigments in the body, that carry energy, and also occurs as part of enzymes involved in energy production. Baozene™ is shown to contain more Iron than Spinach and Apples, two Iron rich foods. Potassium is a very important mineral for the proper function of all cells, tissues, and organs in the human body. 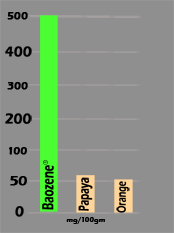 Baozene® contains higher levels of Potassium compared to Bananas and Peaches. Vitamin C is the major water-soluble antioxidant within the body. It has been studied for many years and participates in numerous biochemical reactions, suggesting that it is important for every body process from bone formation to scar tissue repair. 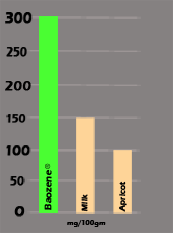 Baozene® is reported to have about 10x more Vitamin C content than an orange, as shown in the chart.